Long moving averages can sometimes be used to tell us the trend direction – is the price above or below the moving average? However, that isn’t enough – how do we determine the trend strength? What about the number of bars that have been above or below the moving average? 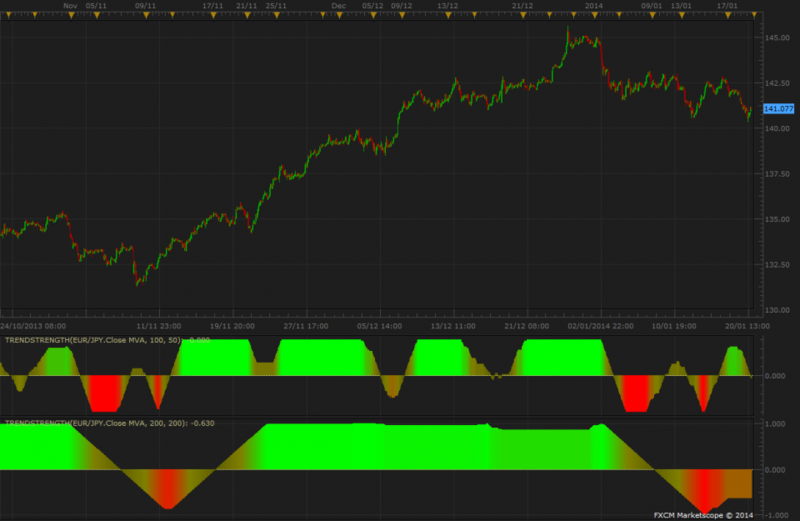 Well, the Trend Strength indicator shows you just that, and by utilizing color shading in its drawing it is easy to see the strength of the trend and not just the direction – all at a glance. Simply choose your moving average calculation method from the available list, the number of periods for your moving average, and the sensitivity of your trend calculation and you are ready to go. Why not add two or three for different time-frames to serve as confirmations! With this indicator, it’s easy! MA Periods – The number of periods (bars or ticks) to use to calculate the moving average. Sensitivity – The number of periods (bars or ticks) to use for the calculation of the trend. The lower the number, the more sensitive the calculation is. Add Yellow – Highlight the areas where the trend strength is weak with extra yellow shading to make it easier for the user to recognize. FXCM is an independent legal entity and is not affiliated with John Colonna or MooMooForex. MooMooForex is not owned, controlled, or operated by FXCM and John Colonna is not an employee, agent or partner of FXCM.